“Le Cœur de Voh,” New Caledonia. Photo source: ©© Wikimedia. 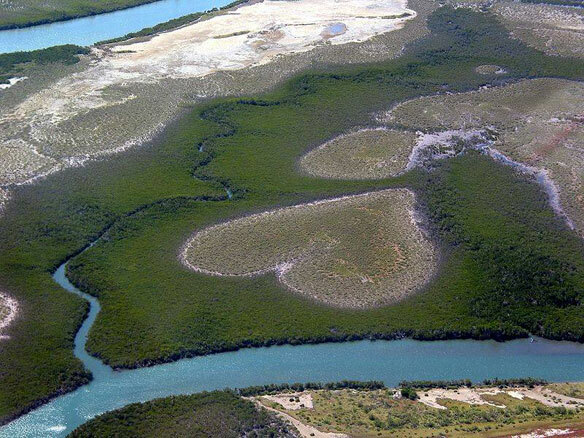 “Le Cœur de Voh,” is a large formation of vegetation within the mangrove swamp, that resembles a heart seen from above. World famous photographer Yann Arthus-Bertrand contributed to Le Coeur de Voh’s popularity by using a photograph of the ‘heart’ as the cover to his book La Terre Vue du Ciel, Earth from Above, amongst other magnificent aerial photographs of the Earth, such as recently featured in Coastal Care.